2 : marc jacobs daisy. I don't wear fragrances very often but Daisy has been my go to for the past two years. light, slighty fruity, fresh- it is perfect!! 3 : stamped name necklace. you guys! this is the perfect necklace. my friend amy bought one as a bridal shower hostess gift and I fell in love as soon as I saw it in the box. obviously I went home and immediately told Joey that I had found my mothers day gift (mine is stamped with beckett). it arrived last week and I haven't taken it off. michelle at the silver wren does amazing work. I've found my new go to for gifts! 4 : anthropologie gift card. honestly, I like just wandering the store and seeing the installations in the window and creative displays. I don't have a problem finding fun things to buy either which is why having a gift card handy is always a plus. 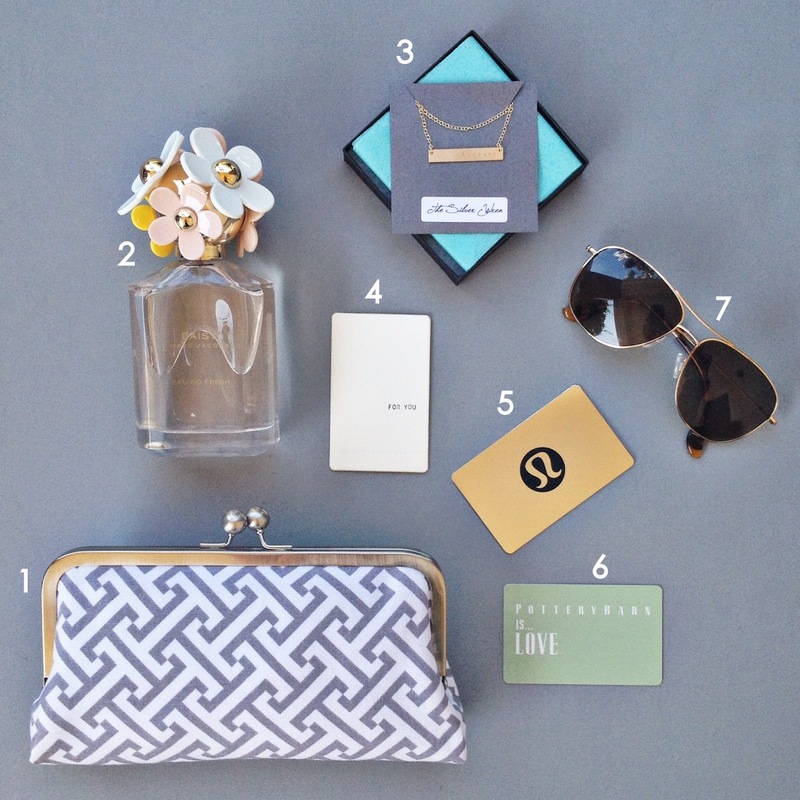 5 : lululemon gift card. I live in work out clothes so sometimes I like to splurge (especially when I get a gift card) and it makes me feel like I'm getting a little dressed up for the day. that counts, right? 6 : pottery barn gift card. gifts cards are a theme, huh? I'm so indecisive I'm hard to buy for, so these are perfect! I get to visit stores and wander aimlessly until something catches my attention. fun for those lazy saturdays where I have hours to fill (which is never). ha! 7 : maui jim sunglasses. I love a good pair of aviators and these are the lightest weight sunglasses I've ever worn. plus they don't hurt behind my ears. score!! hope all you mama's out there have a wonderful day this weekend.